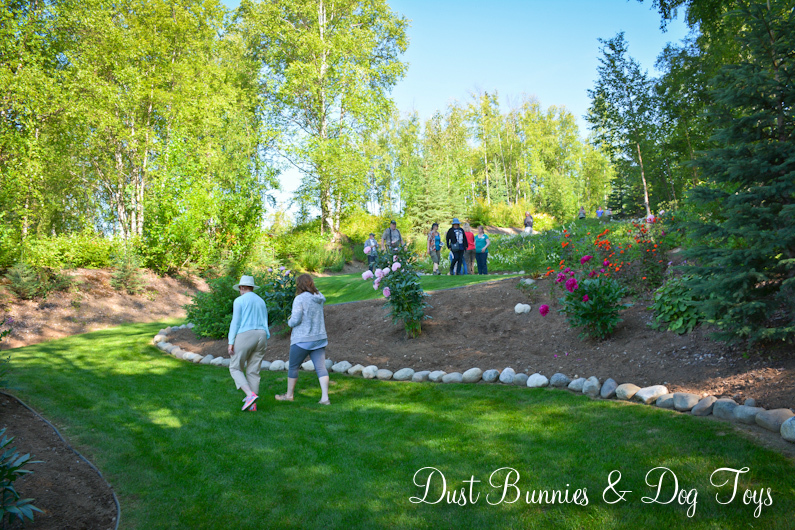 Today I’m sharing a recap of the fantastic garden tour I did last weekend. Grab something to drink and get comfy because there are going to a LOT of pictures in this post! The tour started off at the Willow library where the Willow Garden Club maintains this lovely display garden. I wandered through and enjoyed the flowers while waiting for the maps for the tour to be handed out. 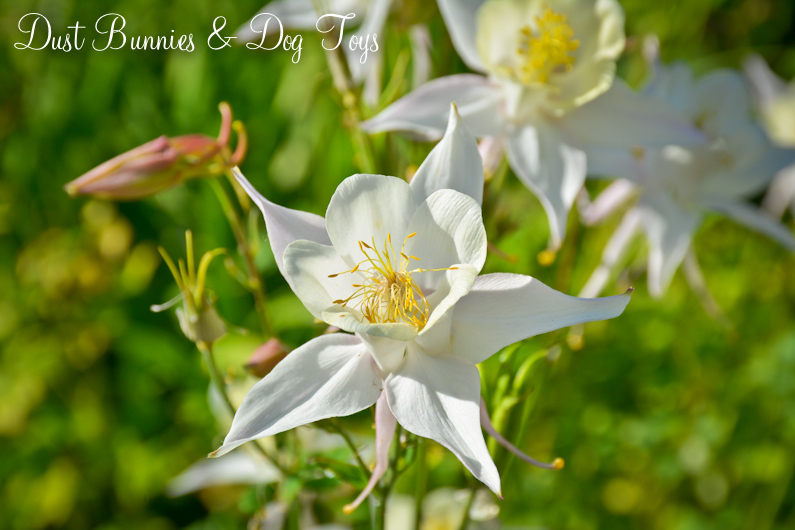 There were several varieties of columbines that were doing quite well. 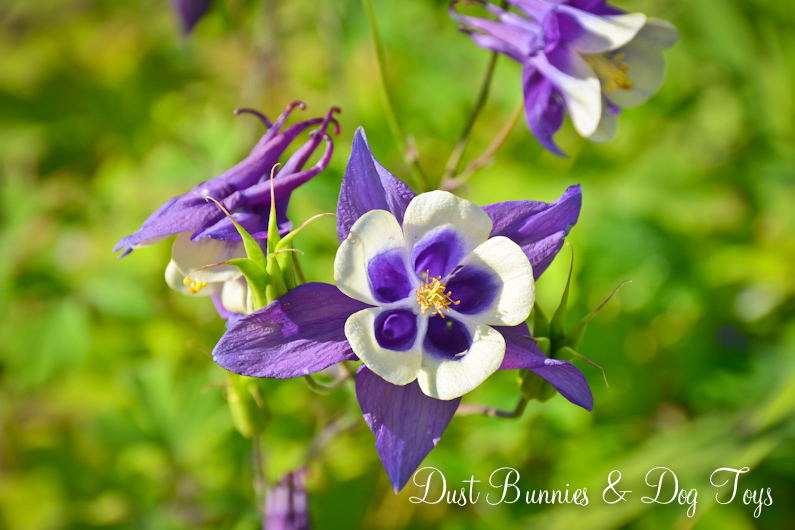 There was also a Monkshead plant tucked between the columbines. I was surprised to see how clumped it’s foliage was as when I spot these growing in the woods on our property it’s usually a single stem with just a few ‘hoods’ on it. I’m going to have to research them a bit more to see if this is a different variety or if it’s just that it is in full sun, versus the shade ours have under the trees. 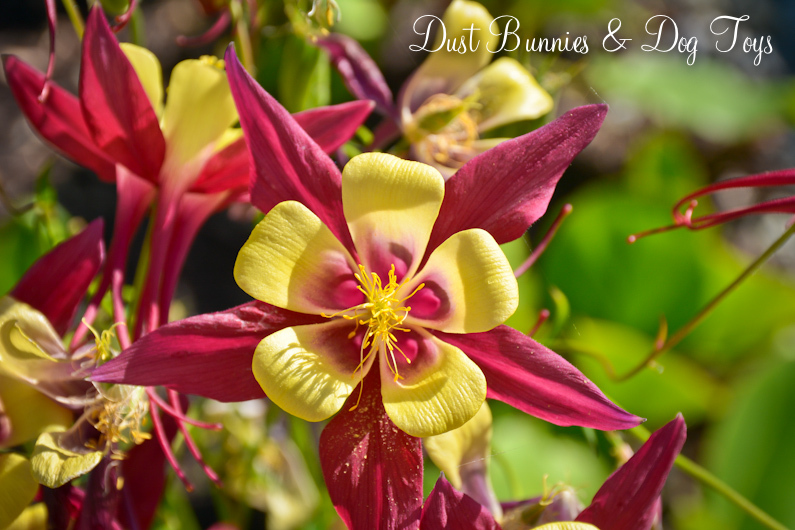 I’m aware that they can be poisonous so I won’t be adding them to the flower beds, but I’d still like to know. The tour organizers gave a brief welcome and introduction to the event, then handed out the maps to the four gardens and lunch location with a short write up about each, which I’ll include in my descriptions below. Most of the gardens were open for the entire time of the tours so you could visit them in any order. I decided to visit the two gardens closest to the lunch spot to get started. 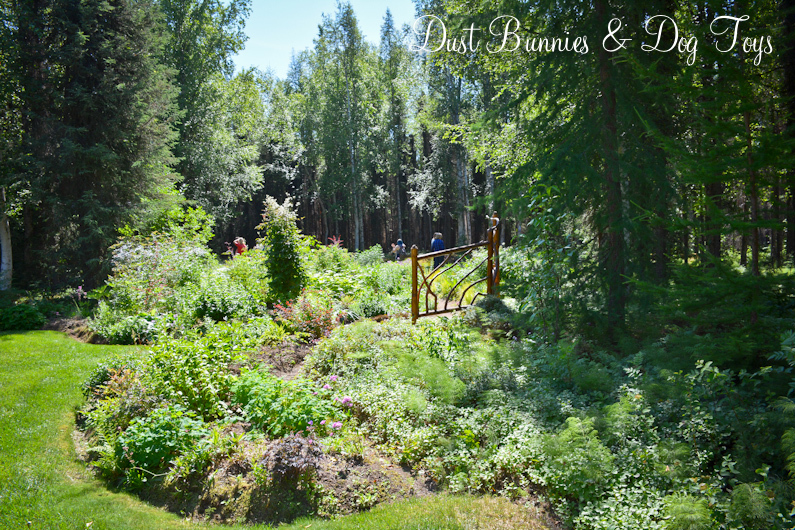 The first garden I visited was Janet & Lee Thibert’s Garden on Nancy Lake. 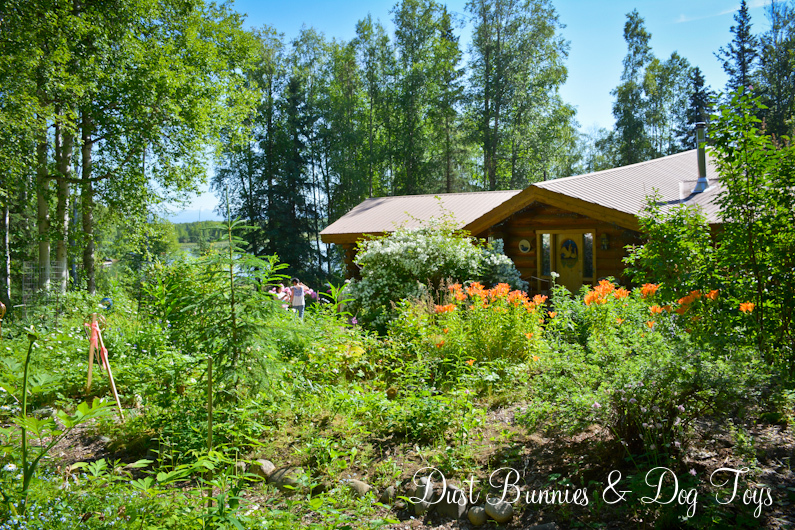 They’ve done a lot of work to the property since purchasing it as a cabin property in 1989. 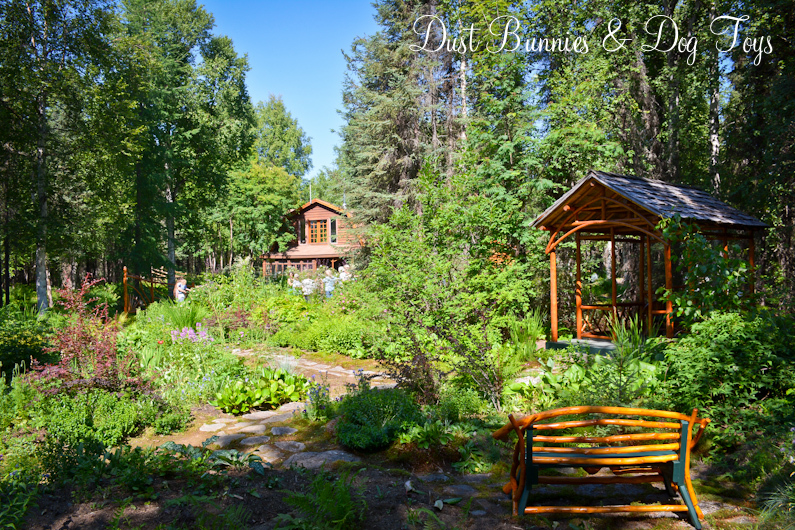 They tore down the cabin and built a lovely home with a verity of landscaping, including peonies, forsythia, dogwood, bleeding heart, roses and many ground cover plants. 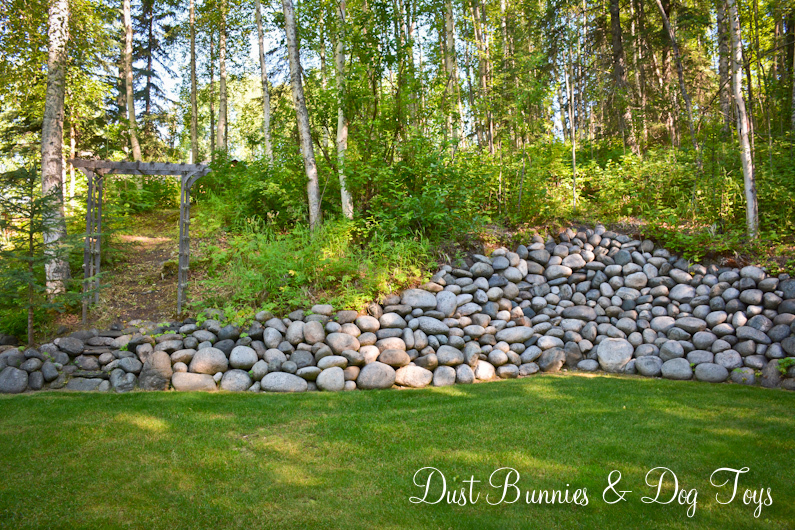 Part of their property has gorgeous rock work that creates a very manicured feeling. 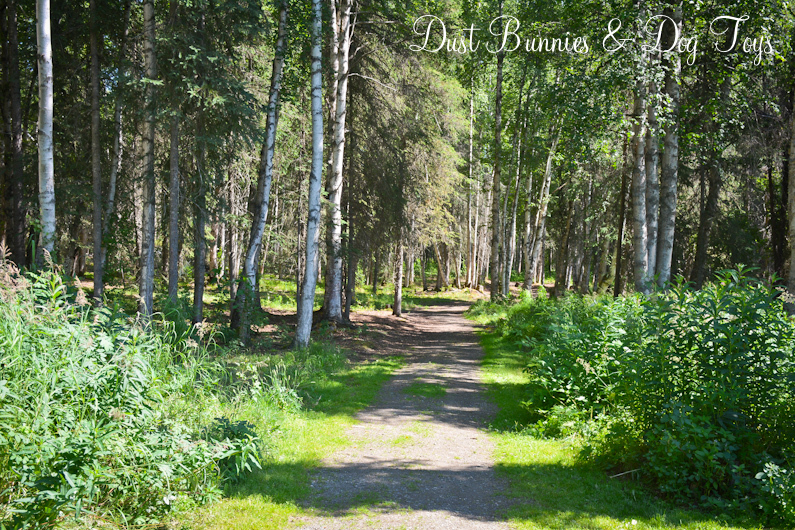 Around their home are many cherry, birch, larch, maple and spruce trees. 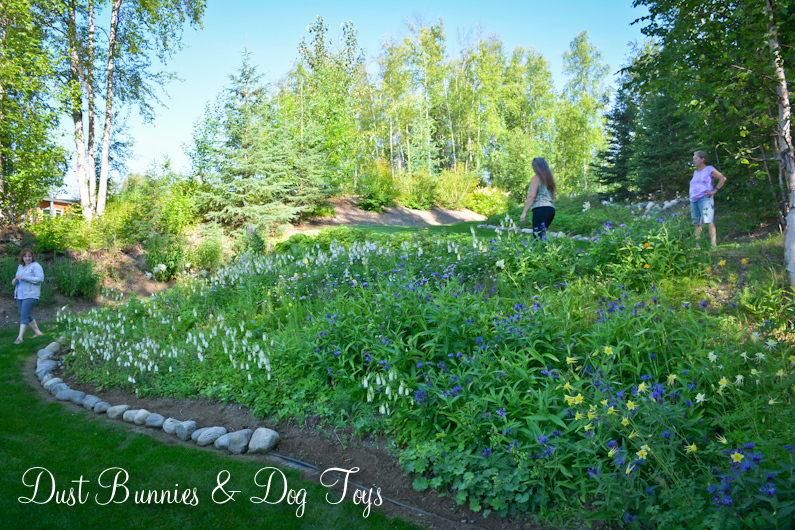 The first part of the garden that tour visitors saw is an adjoining property they purchased a few years ago where they created an idyllic terraced grass and flower beds. The first two beds as you descend the walkway were full of strawberries, which Janet said she uses as ground cover more than a harvest crop, although she did say she will sometimes pick a few to enjoy. 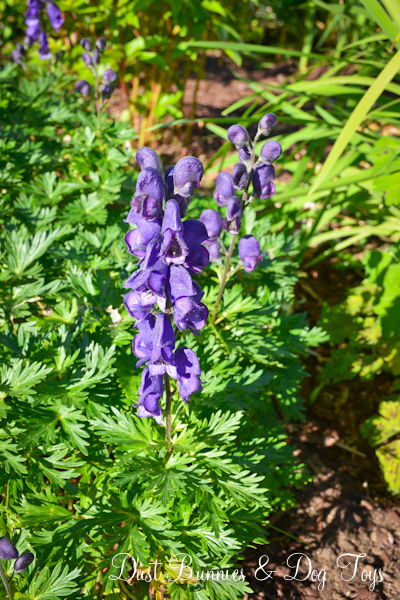 The third bed had a mix of bell flowers and other perennials. 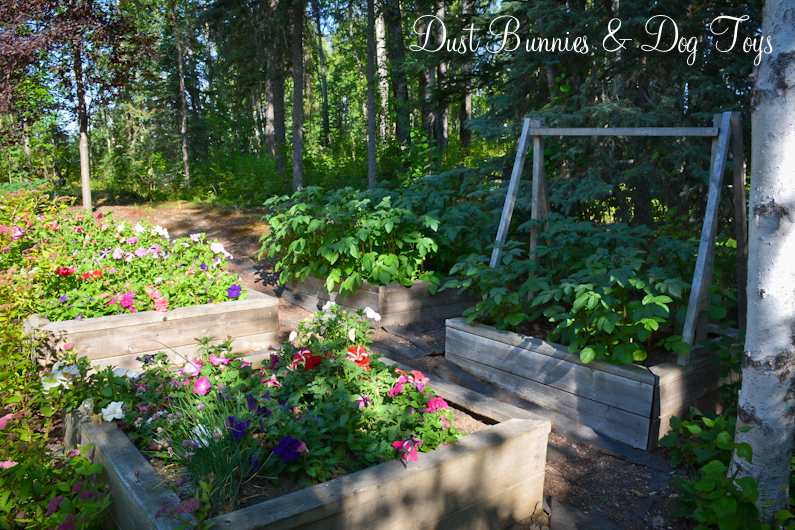 The bottom beds were still under construction but had recently been planted with peonies and poppies that should fill in the space as they grow. Off to the side there was a small trail through the trees that led to their home on the property next door. 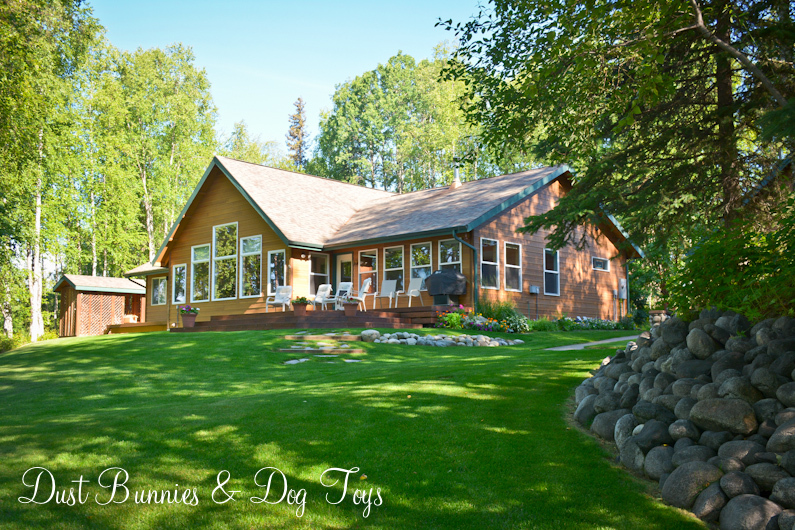 It was a lovely wood style home surrounded by a lush green lawn. 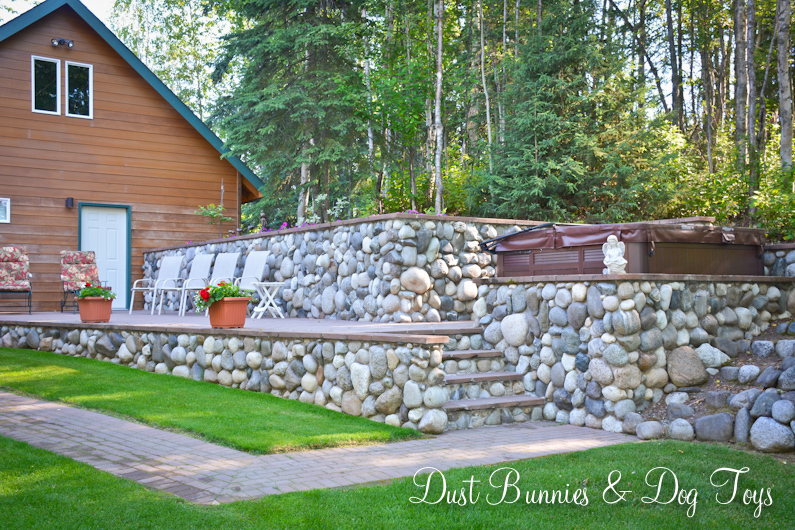 Off to the side they had created a rock retaining wall and raised deck for their hot tub. 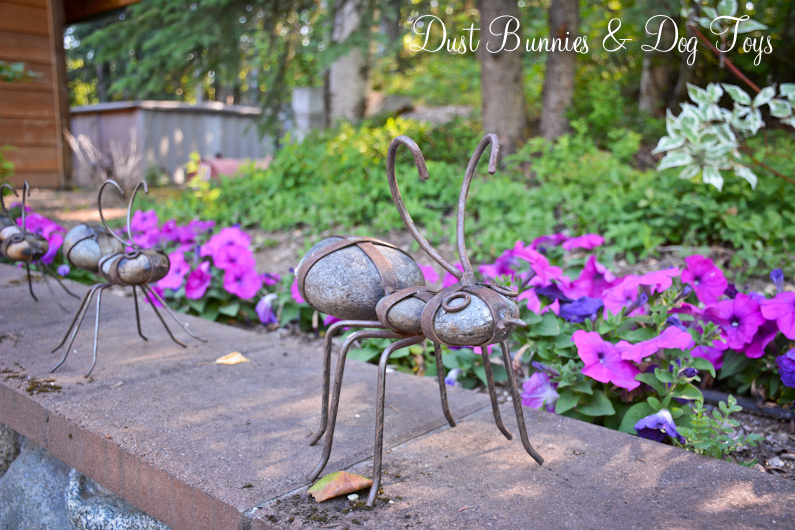 The top of the wall was adorned with pretty annuals and several cool rock sculpture ants. 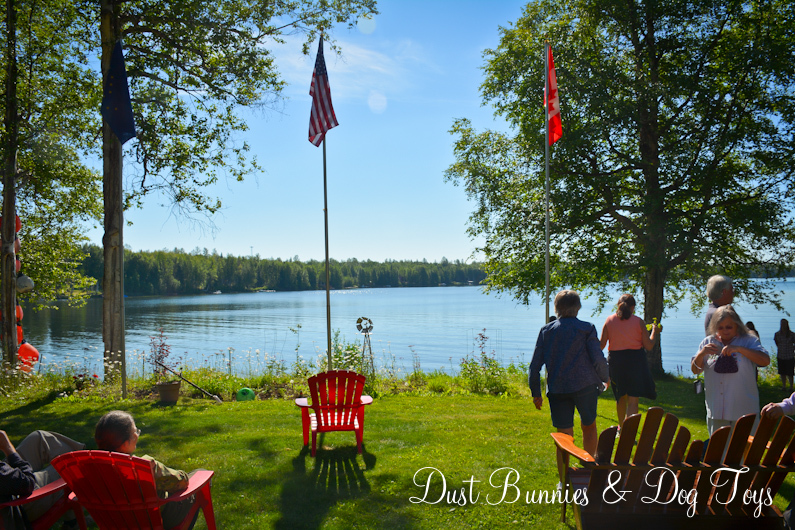 Following the lawn down the opposite hillside led to a beautiful open area with more rock work that reached well above my head before the trail narrowed and led to a dock on the lake. 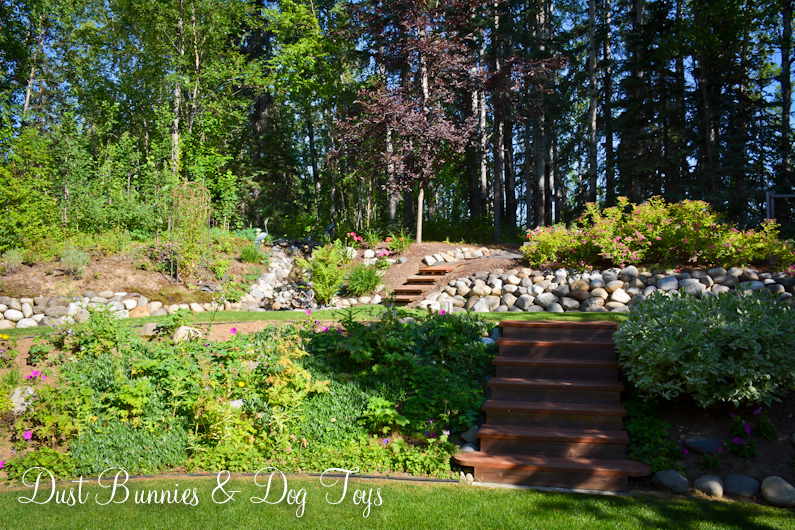 The front of the house was just as stunning, with more grass pathways and and rock work. There was a water feature in the top section of the year and a few raised beds off to the side in an area that looked like it was still being developed. 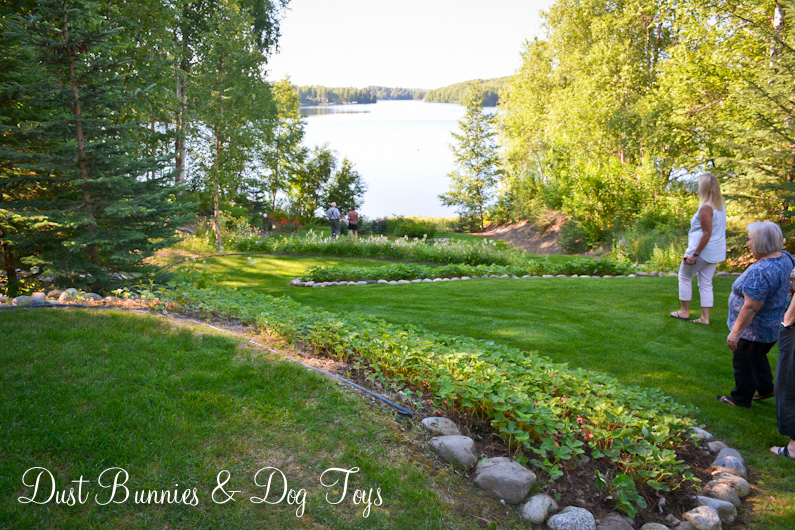 The next garden was “The Birches” on Long Lake. 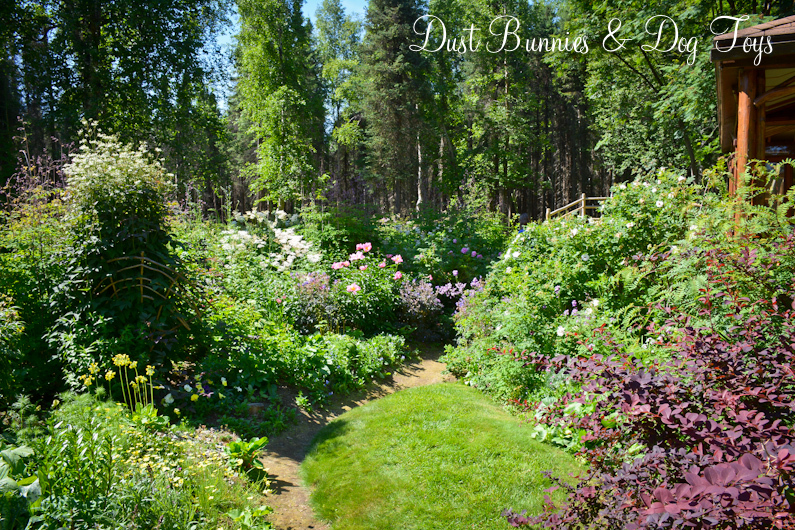 When I arrived I followed others down this amazing tree lined driveway which opened to an amazing country style garden packed with a variety of ferns, iris, currants, rhododendrons, a massive mock orange and other perennials planted many years ago. 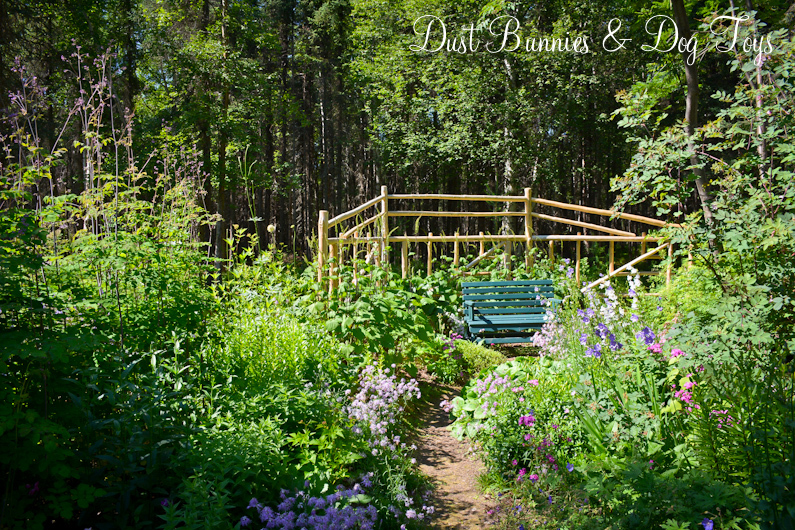 The design of the garden encourages walking through the groupings of plants on several paths. 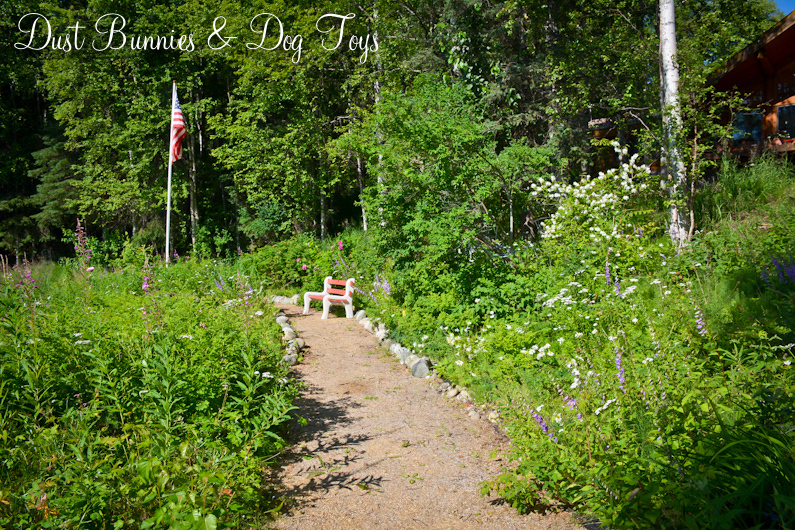 I followed a main path around the house to find this lovely view of the lake accented with more beds of wildflowers along the shore. Off to the side was a pathway that ran along the shore. 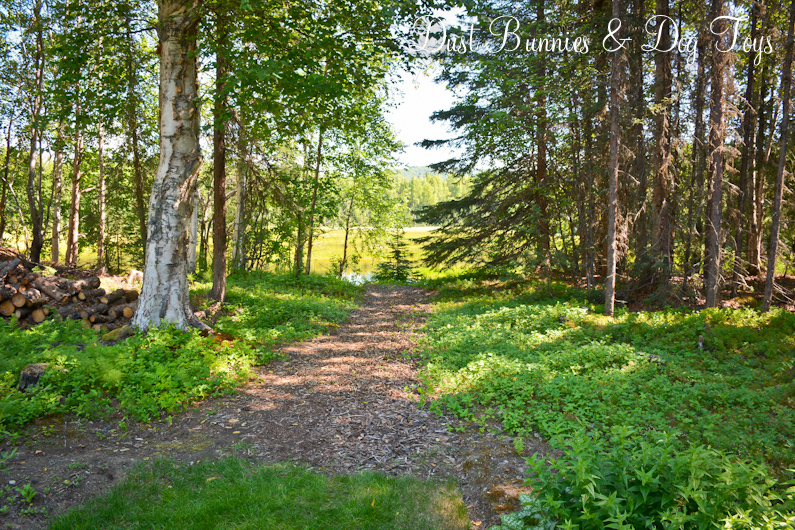 On the other side of the lakeside lawn was a smaller path that curved around the other edge of the shore. 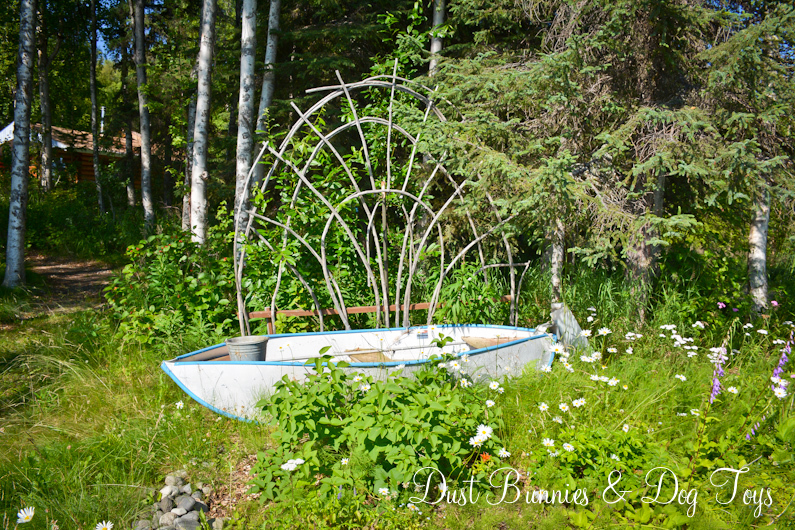 This area had several areas still in development including a fun boat and trellis planter in the making! 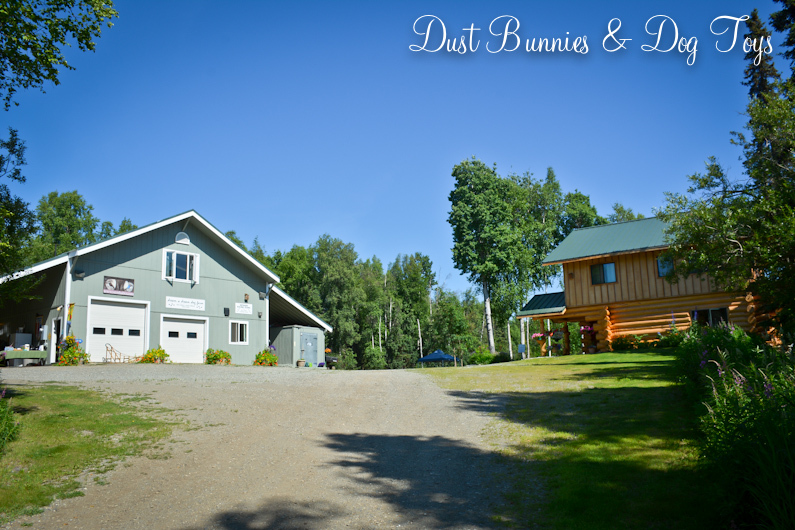 It was time for the lunch stop so I headed a few streets over to the Nuss home on Little Lost Lake. 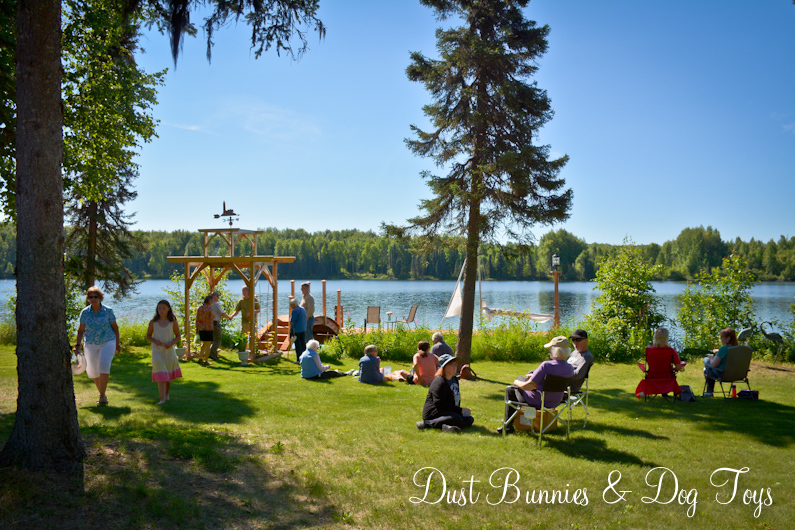 They had a great open lawn area next to the lake where you could see their boat dock and arbor. They had set out a large tent which was decorated with fun paper lanterns. 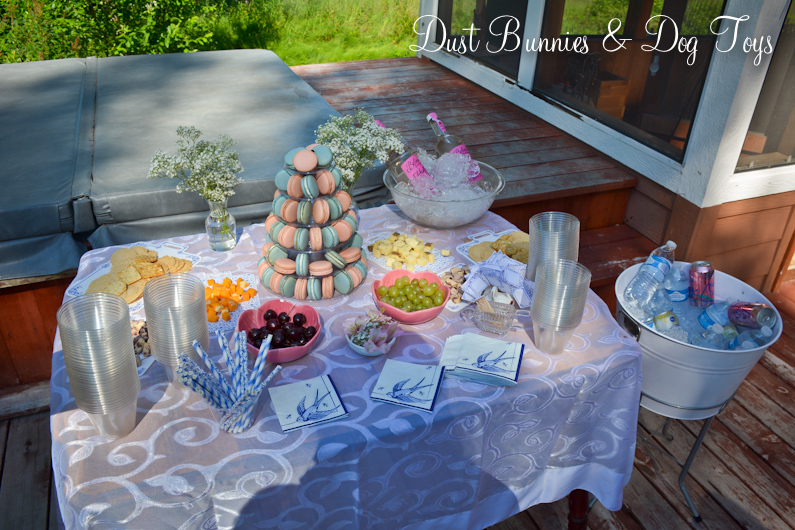 They even had a cute little spread of treats on the deck where they did raffle drawings for plants from several of the host gardens, including several unique and rare varieties. 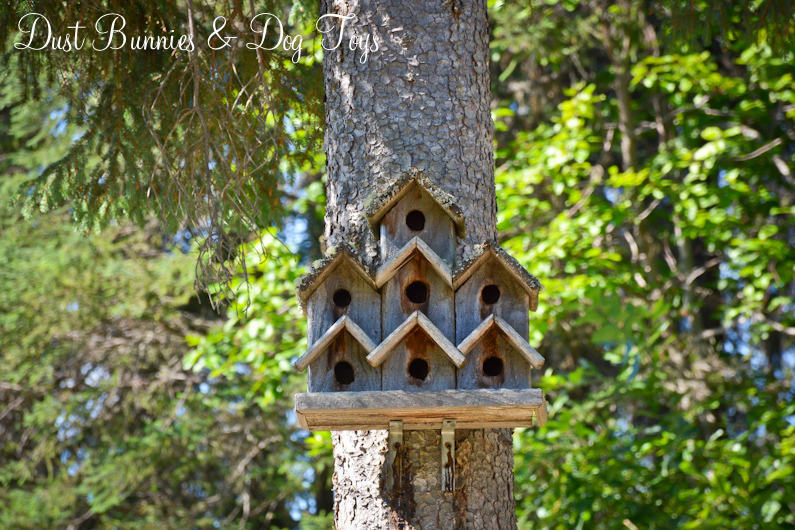 While enjoying my lunch under the tent I spotted this amazing bird house. I’m now on the hunt for something similar to add to my yard. And I got a chuckle out of this guy’s shirt. I need to find one for the Hubs! 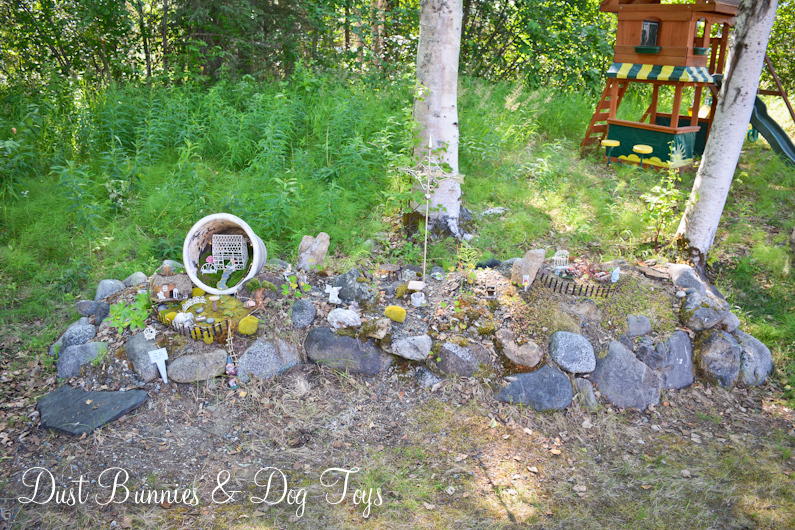 After lunch I spotted this fun little fairy garden out near the driveway as I made my way back to the truck to head to the next garden – the world famous Coyote Garden.! It was the one I was really excited to see and I knew our neighbor friend would be there helping out! 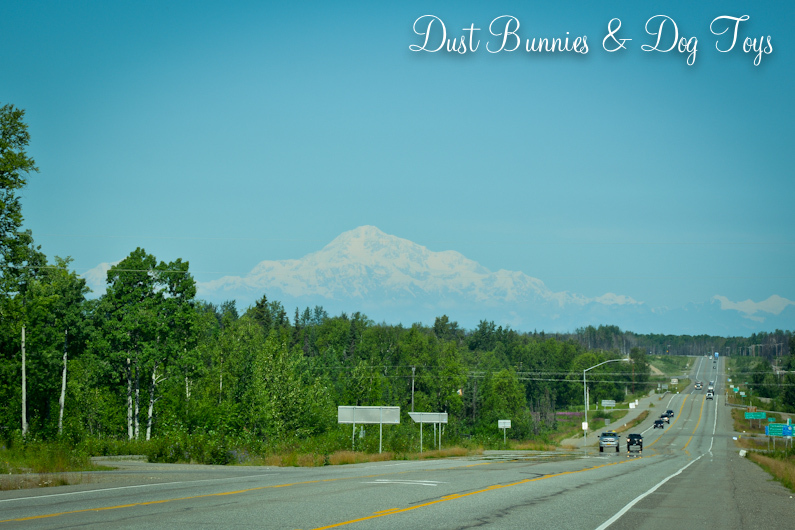 On the way to the next garden I spotted Denali in the distance and just had to pull over to get a shot. It’s still amazing that we can see “the great one” hundreds of miles away. 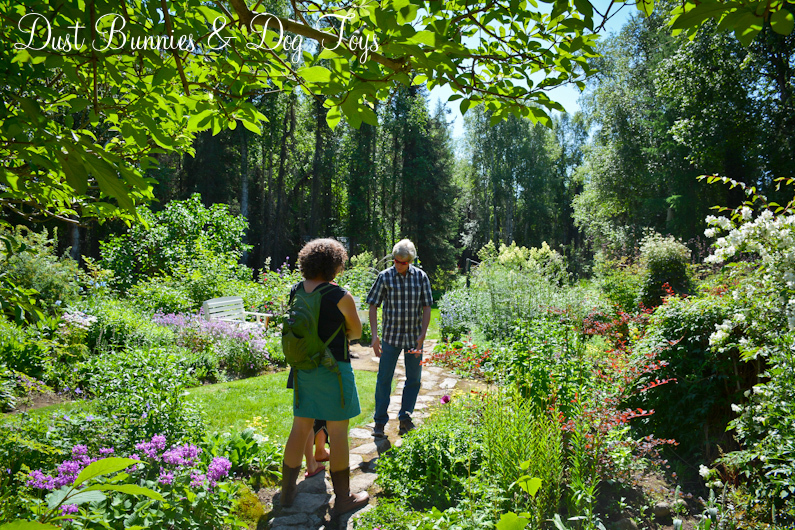 This is Coyote Garden’s 25th year of garden tours! 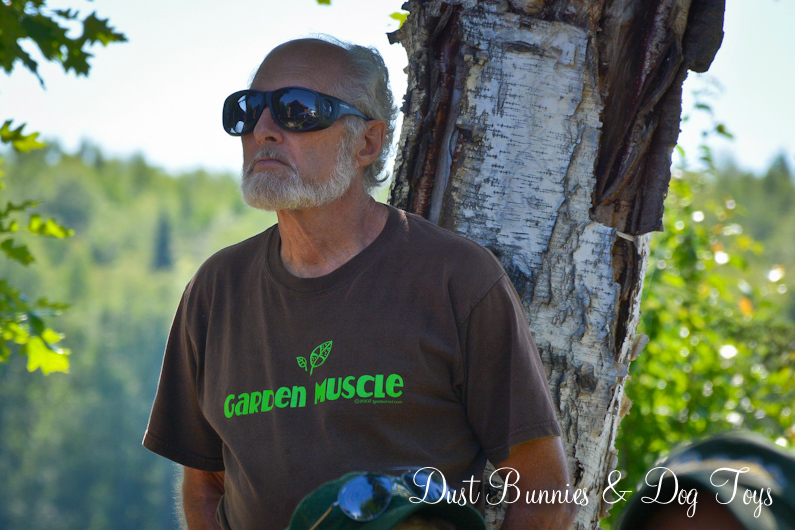 Created by Les Brake and his partner Jerry Conrad, the garden has been featured in numerous magazines over the years. It continues to receive kudos from well-respected garden publications all over the U.S. and was featured in last year’s fall issue of Garden Design with an article written by Dan Hinkley. This year the garden will be profiled in the summer issue of a new magazine for the northwest – Northwest Travel and Life. Our neighbor, Debra took a break from her duties greeting guests to walk through the garden with me and show me around. She also introduced me to both Les and Jerry who are good friends of hers. We started the tour on the deck of the house, which featured several pieces of Jerry’s amazing willow furniture. 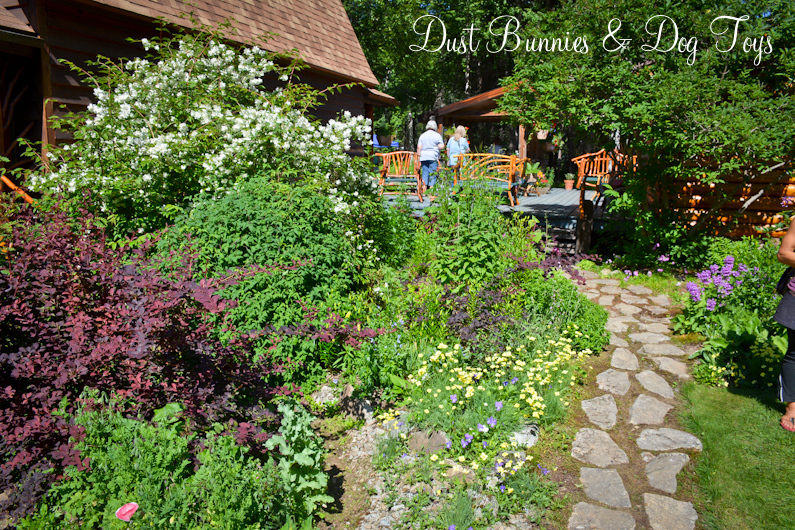 The deck leads to a stone walkway along the side of the house where a variety of perennials were blooming. Near where Les was standing was this amazing poppy. I’ve never seen one with this coloring or pattern and it was the only one I saw there. Looking from the pathway toward the house there is a small area of grass which leads to a narrow trail back around to the front of the house. I’ll share more on that side in a moment. 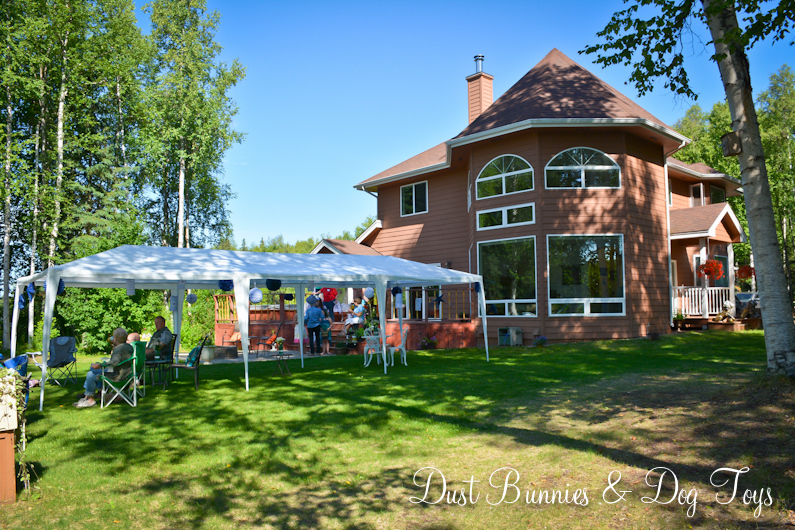 At the end of the stone walkway you go through this curved structure that Jerry built, which leads out to an open lawn area. 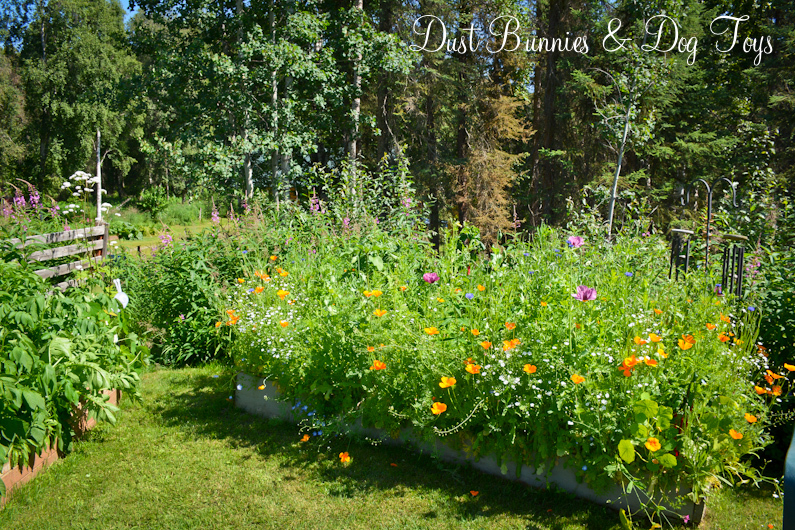 This is the center of the garden as there is more beyond the grassy area that I’ll show shortly. 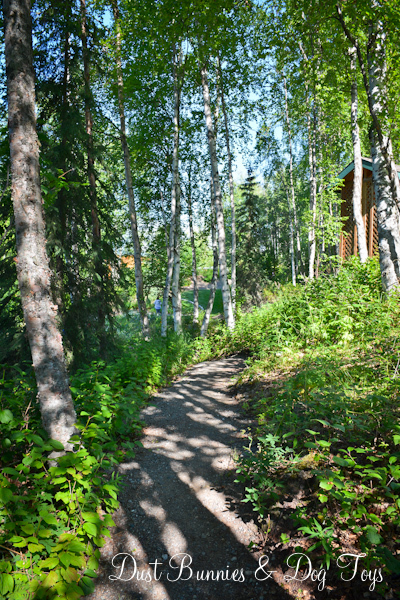 to the left of the grassy area is a small pathway to the lake. Across from the curved structure is this newer back section of the garden. It holds quite a few surprises. 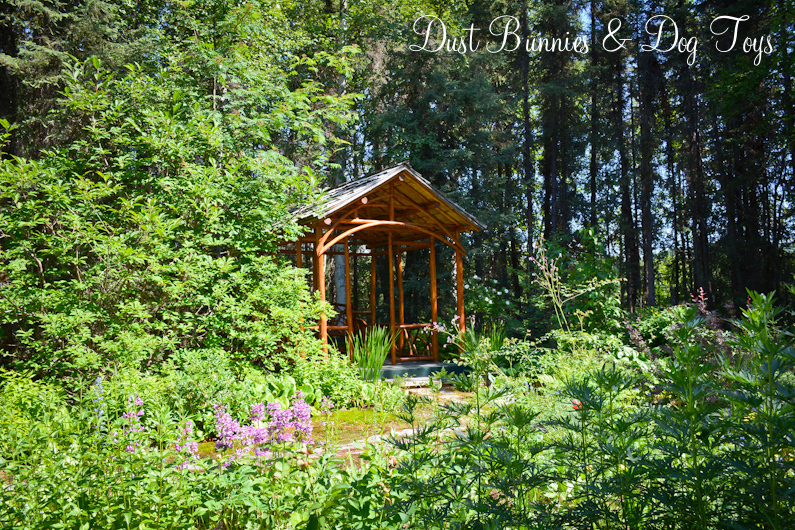 As you enter this area a small gazebo structure is down another stone walkway off to the left. It was created by Jerry using the same methods he makes the willow furniture from. 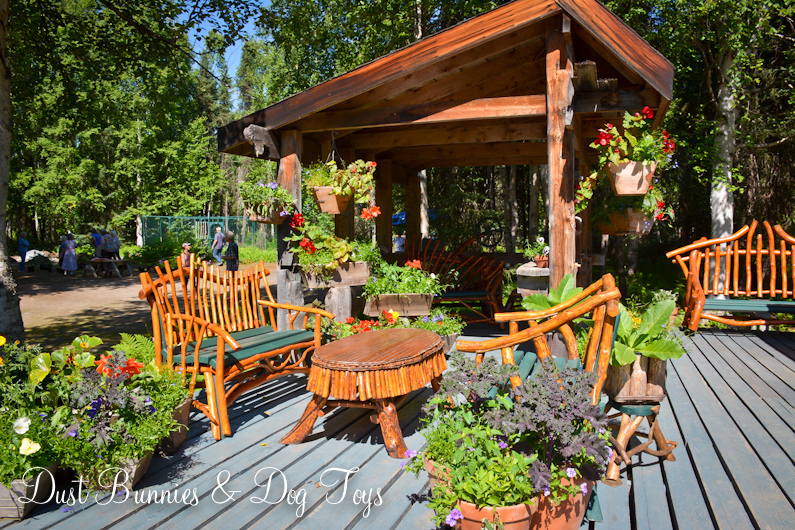 It just begs for you to sit and enjoy the garden. 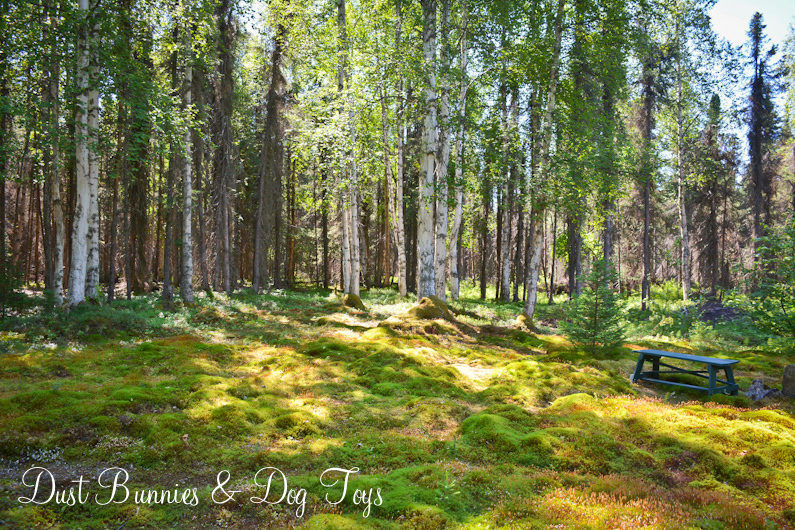 Across from the gazebo is this stunning moss meadow! I just wanted to lay down on it and pretend I was in a fairy tale movie. It would be an unbelievable photo session location! And here’s the view looking back from the moss meadow toward the house to give you a sense of the depth of the gardens. We made our way back up to the original stone path off the deck and wandered behind the house on the narrow trail I mentioned before that leads around the other side of the house. Debra told me that this large structure is new. 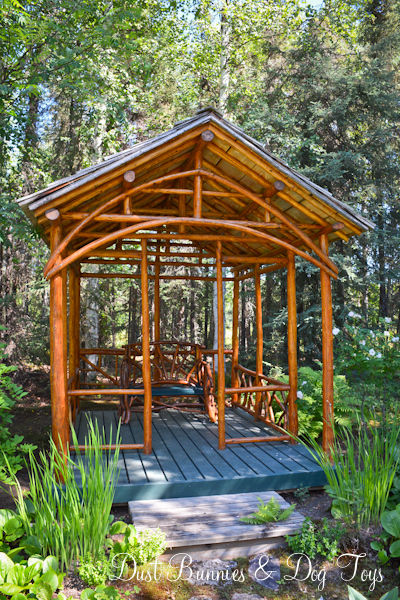 It replaced an older willow structure that was deteriorating after decades in the garden. 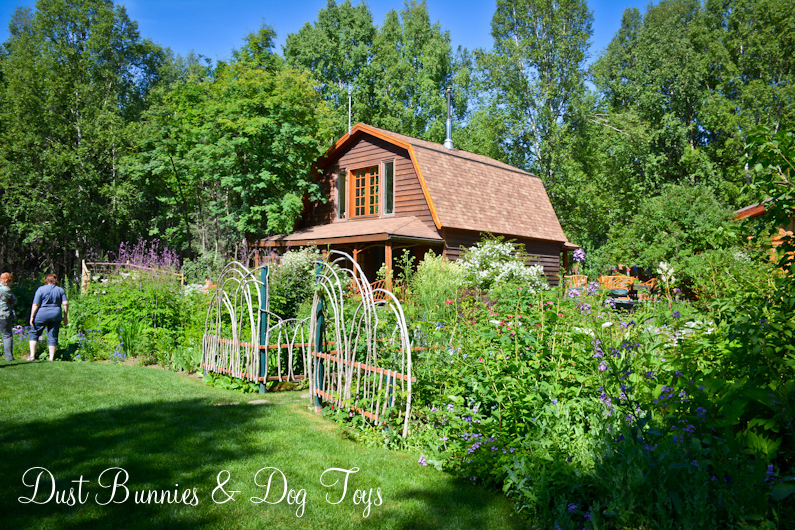 The last garden was Dream a Dream Dog Farm. 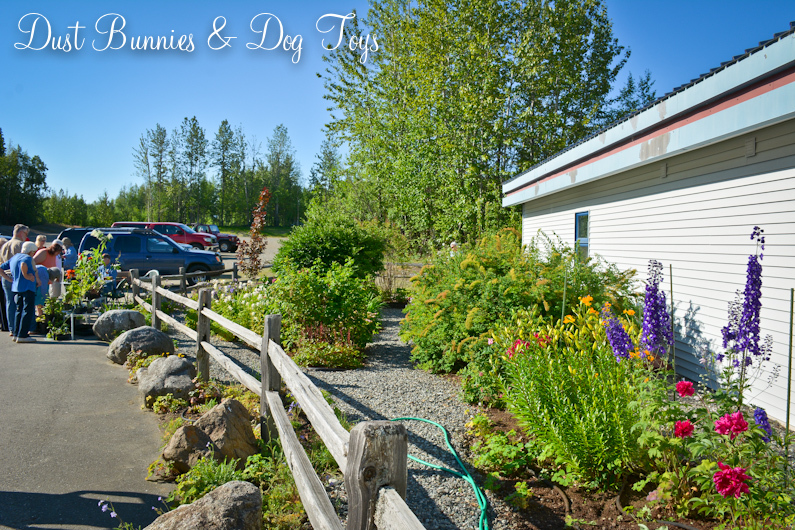 Veterinarian Susan Whiton, and Iditarod musher Vern Halter have combined businesses, pleasure and beauty when they decided to create this lovely bed & breakfast with a garden area to complement a bustling dog kennel. 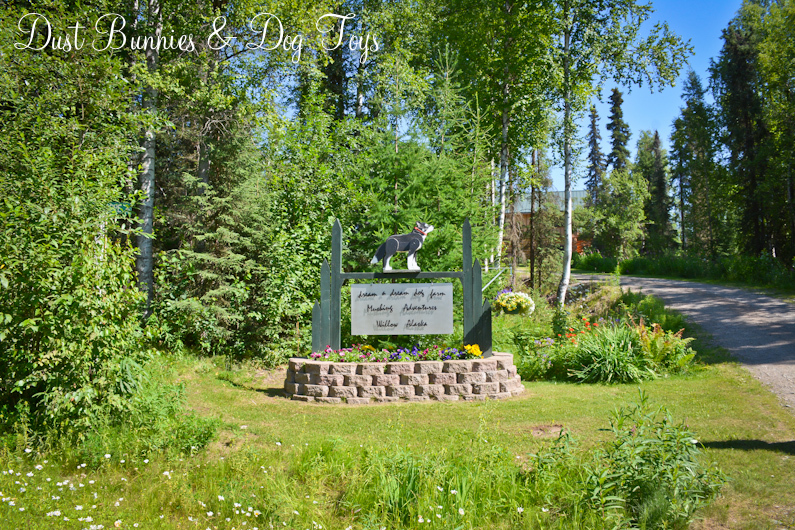 Dream a Dream hosts many visitors every year who wish to savor the true Alaskan experience. I was quite impressed with the spread as I walked up the driveway from the sign at the road. 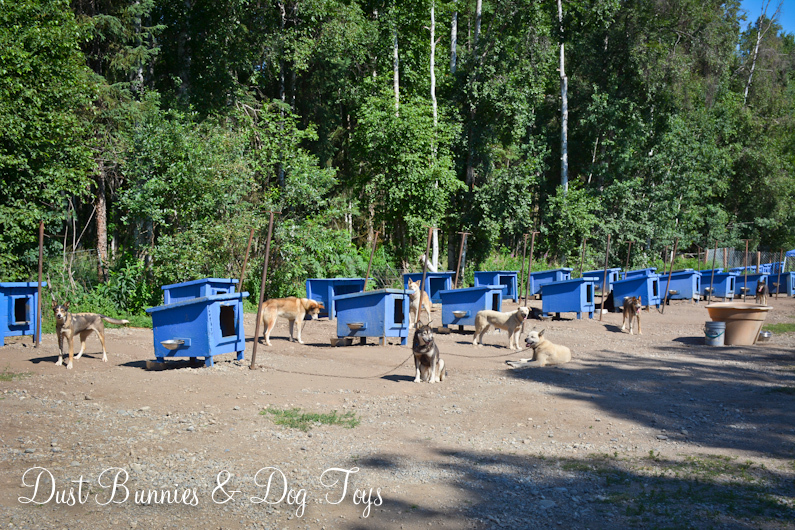 Just past the house and kennel building are the main dogs’ quarters. They were actually very quiet, napping in the sun until one saw my camera and sounded the alarm. Luckily Vern was nearby and told them to pipe down so they all went back to napping. 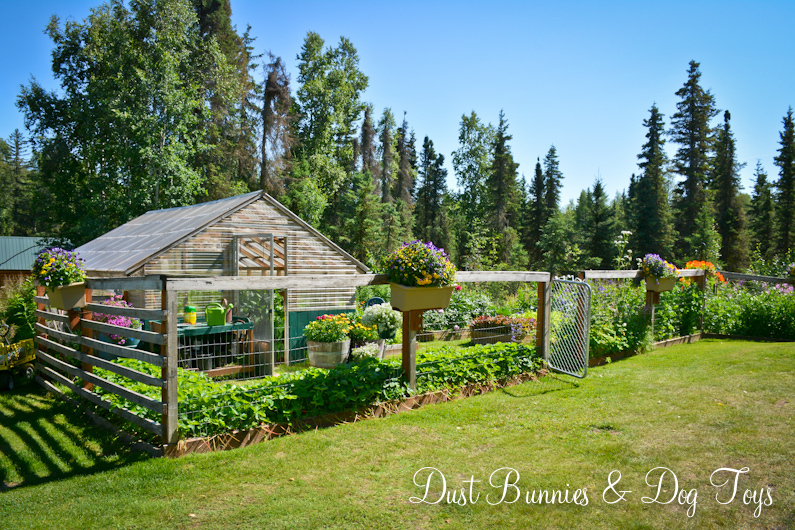 Behind the house is this lovely little garden, which was well laid out to contain a lot of crops, yet still feel wide open. The green house was cram packed and getting good use. 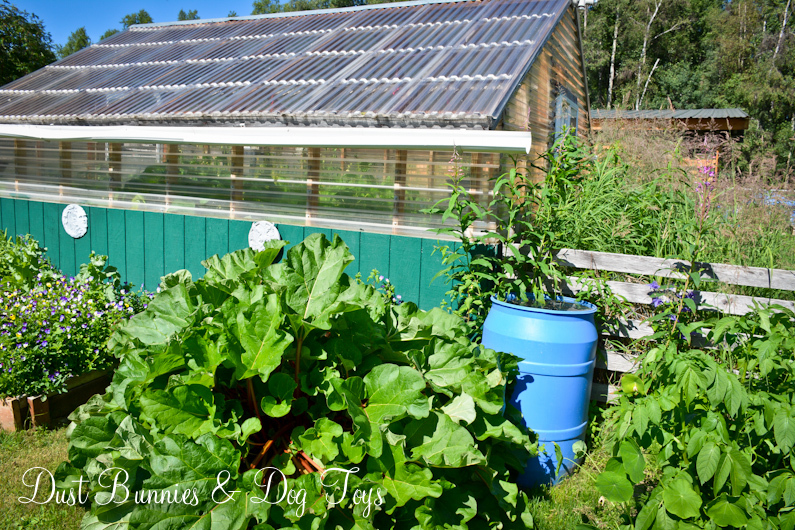 They had a gutter running along the side of the green house that drained into a barrel for rain water collection. We’re setting up a similar option along our shed which will stock the water tank for the raspberries. 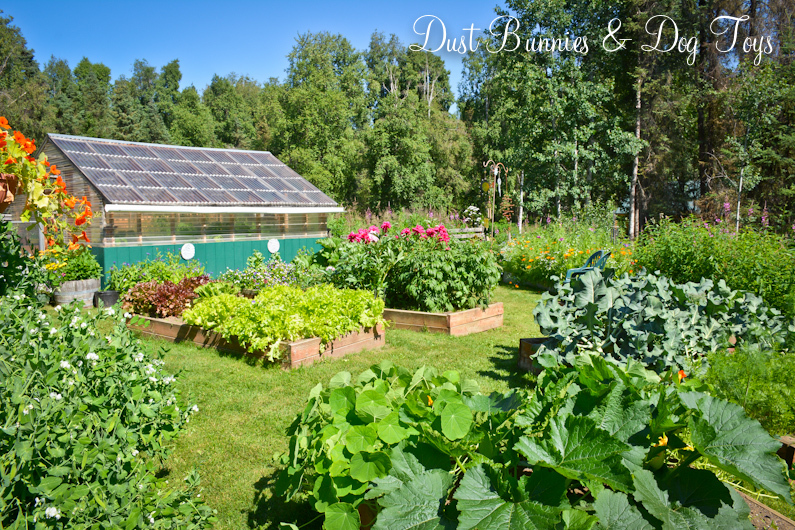 There were several raised beds, some with edible crops and others with flowers. 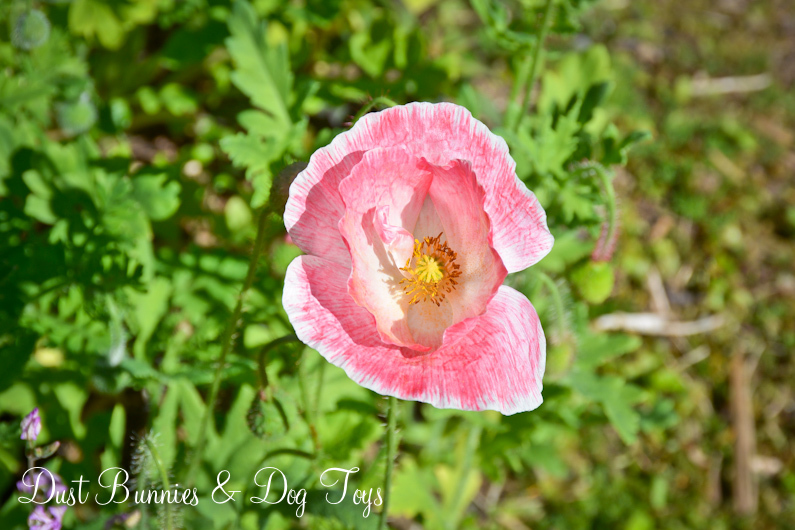 This one was cram packed with a variety of poppies mixed with a few other perennial wildflowers. Here’s the view from the far corner at the front of the garden. It’s amazing how much they’ve fit into this small area. 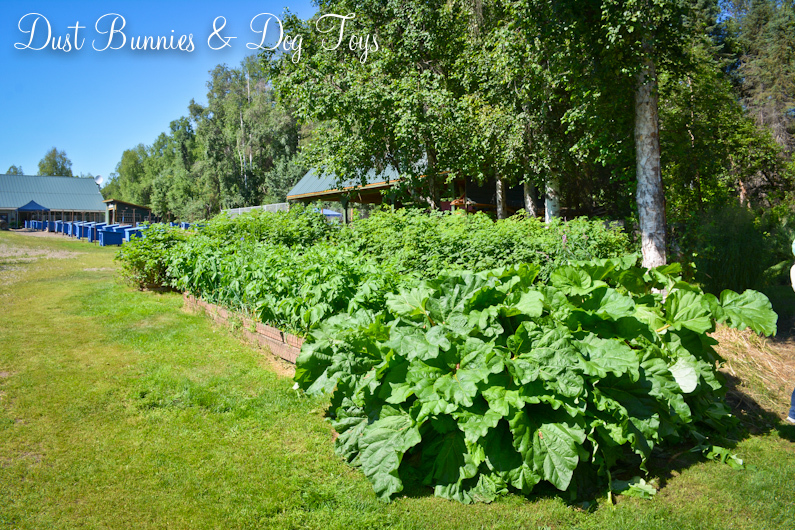 Down the hill from the garden were more raised beds and this monster rhubarb plant. I hope the one I just adopted from a co-worker is this healthy after acclimating to our yard! 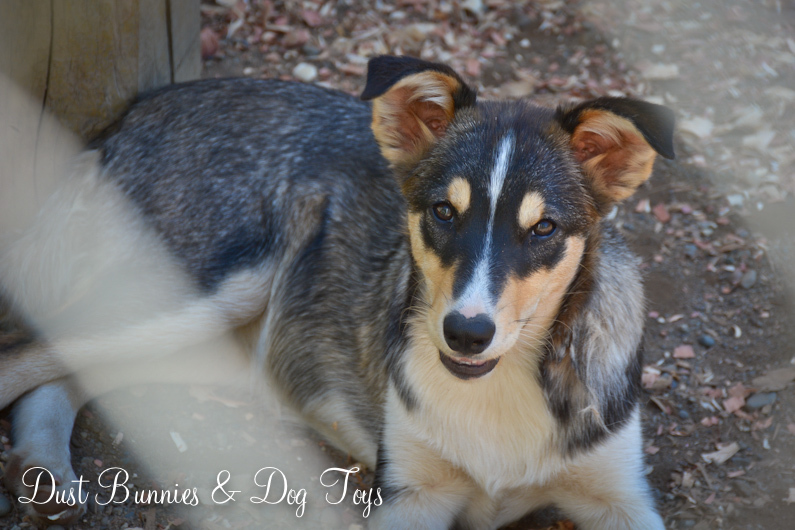 Beyond the gardens was a small enclosure for some of the older puppies. 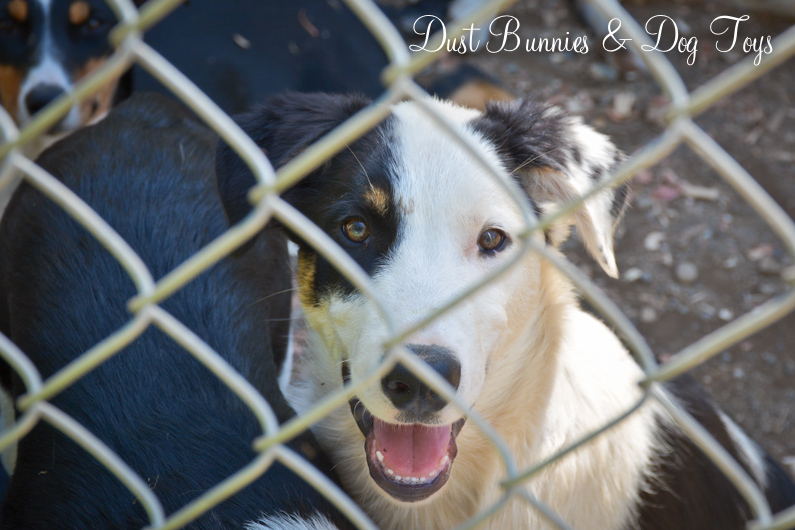 They were so stinkin cute and super friendly. 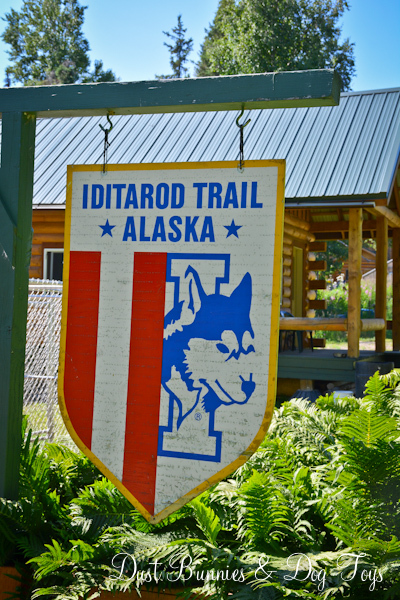 Next to their enclosure was this Iditarod sign, which I’m sure is authentic! 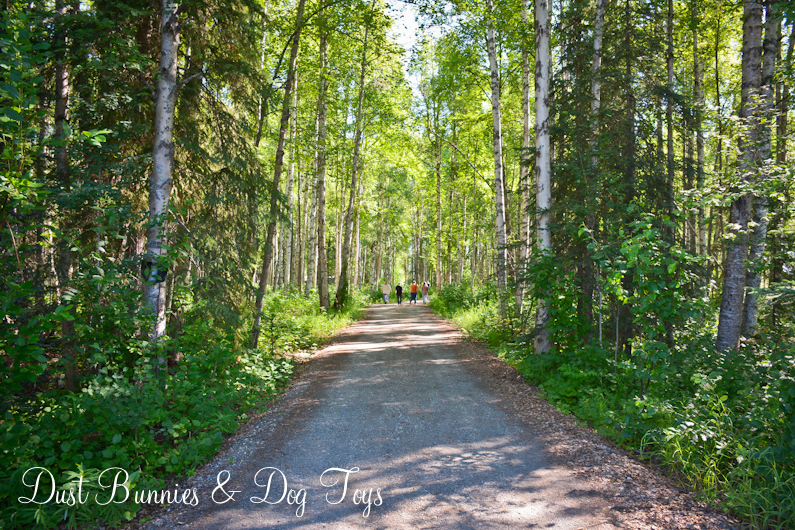 This area of the property opened up to a mushing trail, which is perfect placement for training the dogs. 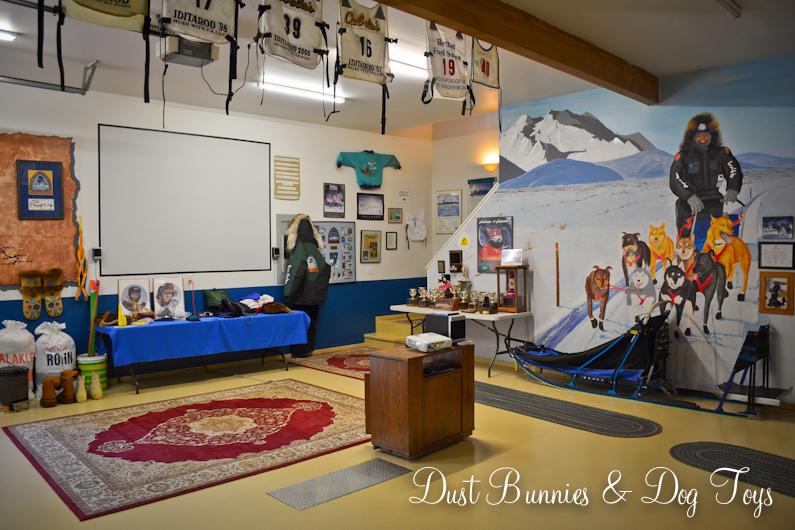 After exploring the gardens I visited the kennel’s building which was set up to entertain tourists and showcase Vern’s mushing career accomplishments. 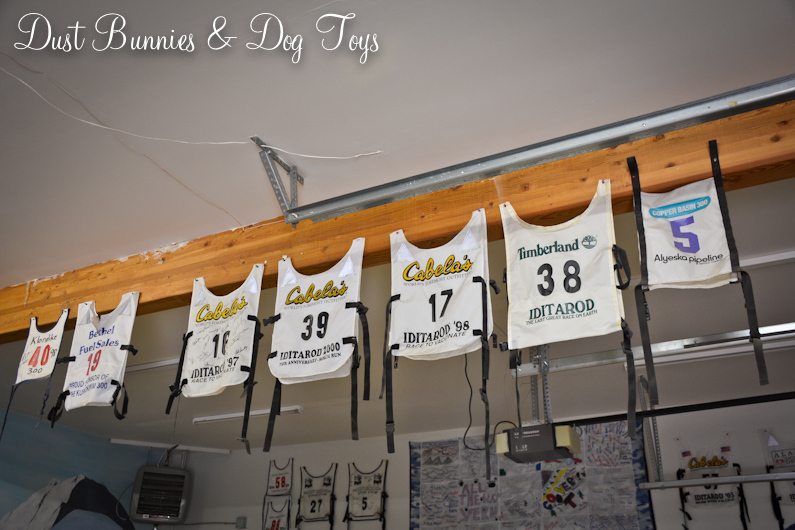 The mural on the wall was a great depiction of him and it was pretty cool to stand under the bibs he’s worn on the trail. 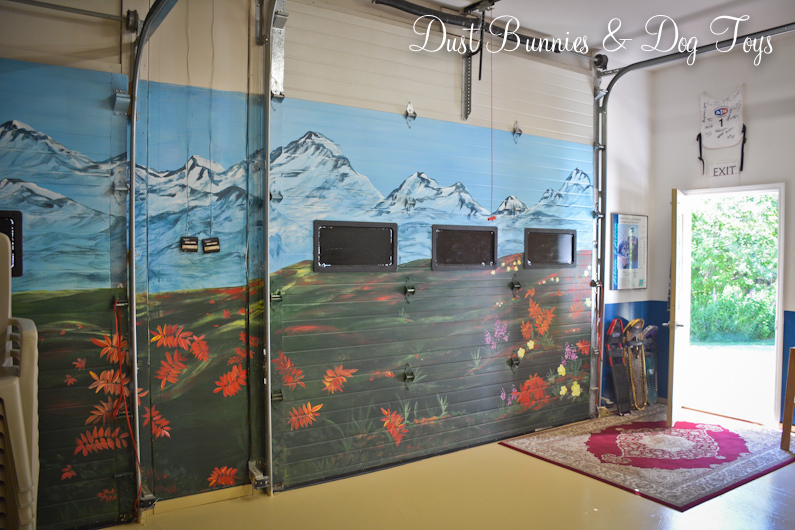 The inside of the large bay doors also had a mural of Alaskan scenery and wildflowers. It was a perfect day for touring gardens and it was so much fun to see the different styles and methods used by each host. 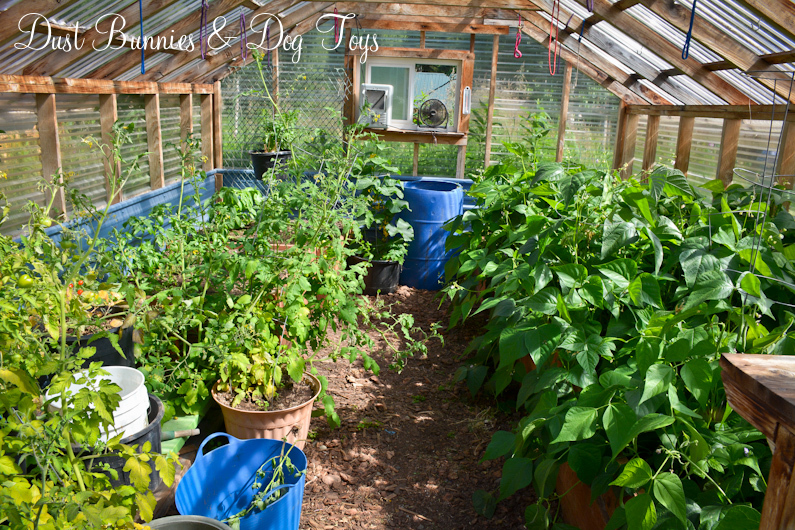 I’ll be putting a few of the ideas I got during the tours in reserve for our property and look forward to attending again next year and seeing some new gardens!